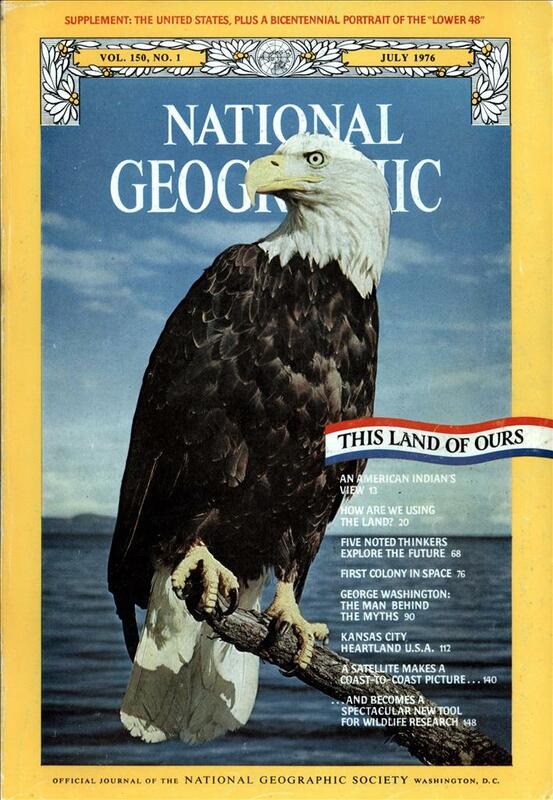 This is a particularly interesting to me because it was published in the month I was born. In a lot of ways these people were exactly right about the problems of today, if not the will or ability of people to make the needed changes. Wealth inequality is getting worse, not better. There is a nascent back-to-the-cities movement, but suburbs, which are so environmentally wasteful, are still occupying ever larger swathes of the country. And people, or at least people in power still don’t care about reducing energy consumption. We haven’t had the energy crunch they predicted yet, but climate change requires almost the same types of societal changes to combat and we just haven’t seen it. Asimov nails the “global village” (internet) and instant communication with anyone at any time. Though for all my hyper-localized social media, I still don’t know the names of any of the people on my floor let alone the rest of my building. I really liked Buckminster Fuller’s quote: “We have typewriters sleeping with the good plumbing and we have people sleeping in the slums.”. It does point out the glaring inefficiency if huge parts of our society. Say one thing about Foxconn, they don’t have this problem. It does seem wasteful to have all of this infrastructure that just sits idle at night. ARE the suburbs dead? Will there be an economic resurgence of our inner cities? Will larger and larger units of government take more and more control over land use? Is mankind in general entering an era of greater affluence, of new and different attitudes toward land ownership? Is the oil crisis a blessing in disguise? These were some of the questions posed when National Geographic invited a group of famed thinkers to discuss possible outlines for the future. 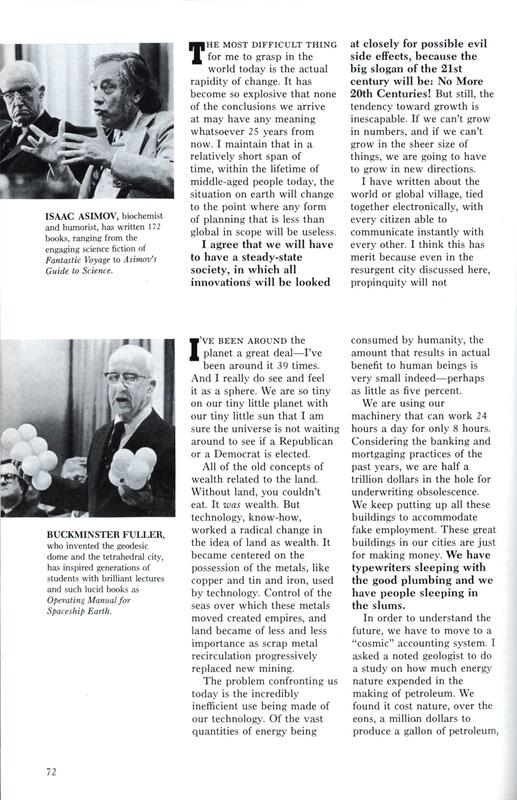 During the day-long seminar at Society headquarters (right), mind-stretching innovator Buckminster Fuller arranged Styrofoam balls to illustrate the rigidity of conventional assumptions. Panelist to his left is author Isaac Asimov and to his right is city planner Edmund N. Bacon. From the Geographic, writer Peter T. White muses with chin in hand; Editor Gilbert M. Grosvenor listens at lower left. The discussion that emerged from around this table was as diverse and thought provoking as the panelists themselves. Following is a digest of their remarks. GERARD PIEL, publisher of Scientific American, studies the impact of urban life on society as a longtime New Yorker. His book, The Acceleration of History, discusses the effects of rapid technological change. The first thing to be said about the future, in my opinion, is that the economic problem—the struggle for subsistence—will have been solved. We have already come to the solution of the economic problem in the industrial world, and most particularly in the United States, by the application of high technology to the creation of wealth. We have depended upon growth to heal the divisions and inequities in our national life. In the past two generations we have reduced the proportion of our people living in poverty from two-thirds to one-tenth. But we have reduced poverty by growth alone, without a change in the distribution of incomes and of property, which remain today very much as they were at the beginning of this century. A curious and ugly symmetry characterizes that distribution: S percent of the people at the top of the pyramid consume IS percent of the national income, while 20 percent at the bottom live on S percent of the income. As we look into the future, the economic problem is not a permanent problem of the human race. Despite the imperfections of our society, however, we see in our vital statistics, and in those of every other industrial nation, the impact of industrial abundance. All the industrial nations are approaching zero population growth. First their death rates came down. Then, with surviving offspring assured, they reduced their birthrates. We have every reason to believe the same will happen in the developing countries, as they achieve economic expansion. The annual growth rate of the United States is now below one percent. So we can look forward to a world of stable human population. If that is the case, we must then think of zero economic growth as well. This is profoundly overturning to all our thinking processes. We face the prospect that growth—the central driving principle of economics — will come to an end. This “steady state” economy I have predicted would not necessarily imply distresses. I think it might be a considerable improvement on our present condition, for the end of economic growth does not mean a stationary state of human improvement. Such an economy, rather, would be engaged in recycling materials and in cherishing renewable resources; the key to both will be the mastery of new sources of energy. The principal enterprise will be education, the perfection of the individual through education for all. When the accumulation of wealth is no longer of high social importance, there will be great changes in the code of morals. It will also be difficult to distinguish work from leisure, with human needs satisfied by some more equitable system of distribution. People will engage in work for their own satisfaction. On the question of land use, I think it is perfectly clear that we’re going to see the end of suburbia. The suburban dwelling is the most wasteful of resources and of energy. All of the public investment in highways, sewers, and all the rest that makes this system possible is accomplished for the more fortunate at the expense of the less fortunate. Suburbia represents the “every-man-for-himself” morality. We’re going to see the American people resettle in the city. City life will now become a communal task and a cooperative enterprise. In the countryside we can expect to see intensive multiple use of the land—and a restoration of the values of rural and wilderness life. The productive land and the wilderness will be the “commons” of society. It’s quite apparent we will be living in the post-petroleum age. If we make the response we have to make to it, we will need to invest at least 600 billion dollars in our energy plan between now and the end of the century. Now if that 600 billion dollars in investments cannot be the energizer of the economy and of the entire social apparatus to accomplish marvelous changes and improvements in the way Americans live, then we really are lost. We stand around wringing our hands over this energy question. In point of fact, this is a godsend of an opportunity to get the private and public sectors together in conducting a major enterprise—the reconstruction of our country. RICHARD F. BABCOCK, Chicago attorney and authority on planning and housing law, is often caught in the fray between environmentalists and advocates of low-cost housing. His book, The Zoning Game, describes the contests waged over private land. We must recognize that for centuries ownership of land has conferred privileges that extend to the ownership of no other commodity. The homestead exemption, the unique rights of the landlord in relation to the tenant, and the relative freedom from governmental constraints on land sales compared to sales of securities are just small illustrations. These are attitudes based upon at least six or seven hundred years of law and social custom. So I suggest that changes in the structure of land ownership and in attitudes toward the rights of owners of land are going to move only with glacial slowness. Some things will change. I believe that by the year 2000 the states will have a significant voice in land-use policy —and they should. The states will take back significant parts of the power they granted to municipalities half a century ago. People realize that we can no longer deal with environment solely at the municipal boundary: Land use determines the environment; it has to be dealt with on a more comprehensive level. Also, there are more and more challenges in the courts to municipal land-use restrictions that tend to keep out people because of their inability to buy expensive housing. I believe the scheme of regulation by the year 2000 will be much like that set out in the American Law Institute’s Model Land Development Code, with the state making the final decisions on large-scale development, on sensitive geographic areas, and on development that has a regional impact. If we are going to have a rational and equitable growth policy, we must get rid of this nonsense that every small community may define the public welfare in its own image, and decide through its zoning and subdivision regulations which economic classes it’s going to let in and which it’s going to keep out. It is equally unreasonable that in our large cities sub-communities of 50,000 to 100,000 people have practically no voice in land-use decisions that affect their neighborhoods. We must figure out a way to “suburbanize” the inner-city neighborhoods—to give them more of a voice. I believe another feature of the year 2000 will be that large-scale ownership of the land will be treated much as we treat public utilities today. Price, rate of return, and soundness of investment will all be subject to scrutiny. Why should the utilities be singled out while the market in real estate continues to operate by 19th-century rules? I suggest that by 2076 dealing in land in the marketplace by government will be an accepted practice. Government will own land, not merely to control growth, but to control price and influence the market. By the year 2076, unless we achieve a racially integrated society, you are going to see our big cities substantially all white. In the next 20 years at the longest, the suburbs, where the jobs are already moving, will be open to blue-collar blacks. Whether that will “Johannesburgize” our cities— black suburbs surrounding a white core—is another question. ISAAC ASIMOV, biochemist and humorist, has written 172 books, ranging from the engaging science fiction of Fantastic Voyage to Asimov’s Guide to Science. The most difficult thing for me to grasp in the world today is the actual rapidity of change. It has become so explosive that none of the conclusions we arrive at may have any meaning whatsoever 25 years from now. I maintain that in a relatively short span of time, within the lifetime of middle-aged people today, the situation on earth will change to the point where any form of planning that is less than global in scope will be useless. I agree that we will have to have a steady-state society, in which all innovations will be looked at closely for possible evil side effects, because the big slogan of the 21st century will be: No More 20th Centuries! But still, the tendency toward growth is inescapable. If we can’t grow in numbers, and if we can’t grow in the sheer size of things, we are going to have to grow in new directions. I have written about the world or global village, tied together electronically, with every citizen able to communicate instantly with every other. I think this has merit because even in the resurgent city discussed here, propinquity will not necessarily mean intercommunication. I live on the 33d floor of a large apartment house in Manhattan. I don’t even know who’s on my floor. It seems to me that there are two other directions we can take—we can go down, we can go up. Down—that is, underground cities—has a lot to recommend it, especially in that it leaves the surface free for other life forms. We can’t consider land use as for the benefit of mankind and mankind only. In an underground society we no longer have weather. We can live all year round in an equable temperature at all latitudes. We can have transportation not affected at all by inclement weather. We can establish our night and day the world over to suit ourselves and thus remove a great deal of what separates us from each other. Going up, however, is perhaps the more attractive ‘ direction and the one that mankind is more likely to take. Our concept of land use now may include not only the land on the surface of the earth. We can colonize the moon or build space colonies (page 76). In the moon we have a world that is really dead, which has no ecology. We can make use of it any way we want, without interfering with any life-force. Colonies, whether they are on the moon or in near space, would fulfill functions that are now fulfilled by the cities on the surface of earth. Properly handled, the earth may become a rather parklike world, a rather low-density world, with most of humanity living in space communities. And then, someday, there will undoubtedly be a panel talking about the future of space use. BUCKMINSTER FULLER, who invented the geodesic dome and the tetrahedral city, has inspired generations of students with brilliant lectures and such lucid books as Operating Manual for Spaceship Earth. I’ve been around the planet a great deal—I’ve been around it 39 times. And I really do see and feel it as a sphere. We are so tiny on our tiny little planet with our tiny little sun that I am sure the universe is not waiting around to see if a Republican or a Democrat is elected. All of the old concepts of wealth related to the land. Without land, you couldn’t eat. It was wealth. But technology, know-how, worked a radical change in the idea of land as wealth. It became centered on the possession of the metals, like copper and tin and iron, used by technology. Control of the seas over which these metals moved created empires, and land became of less and less importance as scrap metal recirculation progressively replaced new mining. The problem confronting us today is the incredibly inefficient use being made of our technology. Of the vast quantities of energy being consumed by humanity, the amount that results in actual benefit to human beings is very small indeed—perhaps as little as five percent. We are using our machinery that can work 24 hours a day for only 8 hours. Considering the banking and mortgaging practices of the past years, we are half a trillion dollars in the hole for underwriting obsolescence. We keep putting up all these buildings to accommodate fake employment. These great buildings in our cities are just for making money. We have typewriters sleeping with the good plumbing and we have people sleeping in the slums. In order to understand the future, we have to move to a “cosmic” accounting system. I asked a noted geologist to do a study on how much energy nature expended in the making of petroleum. We found it cost nature, over the eons, a million dollars to produce a gallon of petroleum, at the rate at which you and I pay for electricity. This makes selling Manhattan Island for twenty-four dollars look like nothing. All those people driving in to work every day—they’re each spending two or three million dollars a day, at least by nature’s accounting. For centuries we have lived in an East-West world, with national wealth depending upon control of the oceans over which moved the raw materials for industrial nations. But the wealth now is in energy and its production, and we must consider a North-South world bound together across the North Pole. Right over the Pole from the Americas are the Soviet Union and China. The technology of ultrahigh-voltage electrical transmission makes it possible to connect Russia, China, and the Americas into a single gigantic power grid. This grid would connect night and day; at one time or another, SO percent of our electrical generating capacity is not working, but with night and day connected in an intercontinental grid, we suddenly discover that our generating capacity has been doubled. Nothing will bring world economics into common accounting more rapidly than that energy grid. For the past 20 years, we have had the nations of the earth getting ready for Armageddon, taking the highest capabilities of man and focusing them on waste. I know the political assumptions that say there is not enough to go around are invalid. I know now that politics is invalid. I know war is invalid. Yet, I also know the technology, and I know it is highly feasible to take care of all humanity at higher standards than anyone has known. Just consider that today one communications satellite weighing less than a ton can outperform the transatlantic communications system with its 175,000 tons of copper cable. In times past, with 90 percent of humanity living on farms, the human race was inherently remote. Every nation looked out for its own welfare. But now we are in absolute critical proximity. A completely new world has come about. Our greatest challenge today is not at all how we get on independently but how we get on together. EDMUND N. BACON, city planner, encouraged citizen participation when he helped spark the rebirth of Philadelphia, his hometown. His book, Design of Cities, travels from Athens to Brasilia. In the future we have to perceive ourselves as urban people. The mere acceptance of the notion that we are an urban civilization will be an important revolution in thought, because we still cling to the nostalgic idea that we are primarily rural. We are assisted considerably in facing up to the problems of urban settlement by the fact that the petroleum of the world is rapidly becoming exhausted. We are going to have to move from a petroleum-base mobility to an electric-base mobility. We’ve got to quit using petroleum for our basic way of getting around. This has enormous consequences. The form of the cities will be different. The future extensions of our cities, the future housing, will occur in relatively intense areas clustered on electric-transportation lines. Since these lines will converge toward the existing center of the city, it means that the center, which we think of at the moment as decaying and being abandoned, will have a resurgence and will again become the focal point of communication. The great illusion of the suburban experience was that man can experience nature by owning pieces of it. And that is fundamentally incorrect. Nature eludes ownership. Becoming more urban and less suburban will also reverse the rhythm of life, to our great benefit. Right now a suburbanite goes daily in and out, leaving his nature in the morning and coming home when the sun is setting and the children are going to bed. A genuinely urban civilization would have not a daily but a weekly rhythm. We would spend the workweek, perhaps four days, in the highly social atmosphere of the city, at the end of which we would move outward to the mountains and the sea and the farm. Low density of the suburbs is nothing but an insulation of human communication. Intensive development is necessary for the quality of the life of the children. They should not have to depend upon their mothers being chauffeurs in order to make contact with friends. Let us visualize the re-utilized city. Blocks will be reorganized to represent separate living communities. At the end of each block there will be electric buses and electric taxicabs. The only reason for a vehicle will be to bring a baby home from the hospital or to take a casket out. By this concept we lead people into a view of the removal of petroleum as being not an obstacle, but a fine, creative thing. There is more than plenty of space in our cities. In Philadelphia there are 28,000 abandoned houses and 12,000 vacant lots. It ends up that 40,000 units are abandoned in the middle of the city, with all the sewers and water and everything else provided. Again there is a trend toward the concept of homesteading—not in the prairies, but in the wastelands of our inner cities. We don’t have to build new towns. The new technological town is a total dead end. Besides, there is a whole series of middle-size cities that have a new possibility for creating new life-styles, including a more sympathetic approach to nature and less consumptive ways of doing things. New perceptions of land are going to make for a situation where private property versus control doesn’t become the main conflict. The American people are quite capable of being way ahead of the scientists, technologists, and philosophers. Americans love their land, and they need to be shown how better to cherish it. What amazes me about those predicting the future is the way they leave out human emotion, needs and wants. Example, sure integrating the worlds power grids would enable great generating ability.. But who want to tie themselves to another and become interdependent on each other. They mention the empty areas of Philadephia – some were created by the high density “projects” of social housing. And the bit about living in an apartment and not knowing people on your floor resonates – as does Charlie’s observation. I’m so glad we moved to a street a few decades ago, though as the neighbors change we’re probably not getting to know the new ones as well as we did the old. It’s a bit odd, as when I lived in military housing, there was always a bunch of new kids/neighbors/etc. You got to know them quickly even if you knew that either you or they would move away in an average of about 15 months.